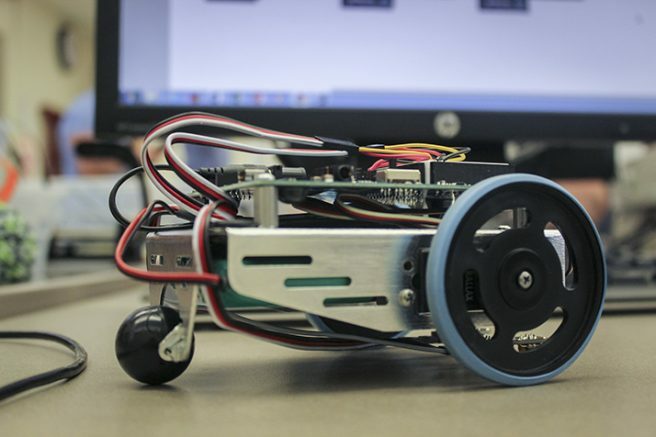 A classroom in the Tech Ed building at American River College became a robotic speedway as students raced custom-made automations against each other, and the clock, on Feb. 28. 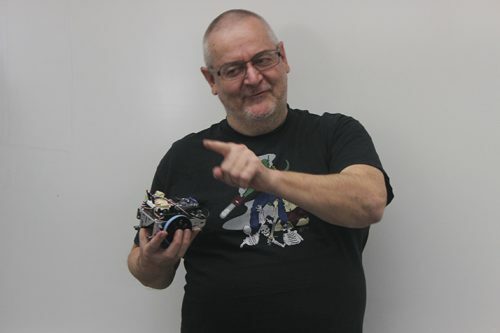 Jordan Meyer, a professor of electronic technology at ARC, challenged his students to build, code and race an autonomous robot for their midterm. Students were provided with kits to build their robots and base code in the program BlocklyProp. According to Meyer, the goal of the midterm was to build the robot and adjust the code precisely enough that the robot followed a black electric tape track as quickly and efficiently as possible. Students passed as long as their robots made it around the track. “Just as sort of a fun exercise, we’re having a race to see who can go around the fastest,” Meyer said. The robots consisted of a board with two motors that power the drive wheels and a propeller activity board that uses two sensors to detect the black line on the floor. “The processor reads the information from the sensors and then sends commands to the motors to tell them whether they need to go forward or backward or turn or whatever,” Meyer said. Students found that creating an optimal code is an essential part of having a winning robot. According to Meyer, BlocklyProp is user-friendly for beginners because it reduces the amount of syntax users need to keep track of. “It is a graphical programing language. So instead of typing out all the lines of code, like you would in a traditional language, you put commands together using little blocks that snap together almost like Legos,” he said. While BlocklyProp may be an easier coding program for most, some first-time robotics students still struggled with the syntax. Austin Kettle, a mechatronics major, found that even simple mistakes made a huge difference in the function of his robot. 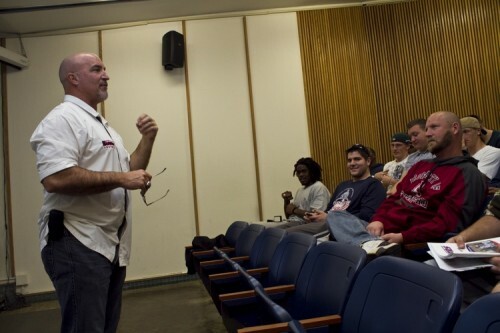 “It was super hard because I didn’t have the numbers right … If you don’t have the right code then it will not work. Mine was just spinning in circles for the longest time,” he said. He managed to get his robot working the day of the midterm and passed with a time of 33 seconds. “Not the fastest but I just actually got mine working today so I’m pretty stoked,” he said. Other students came hungry to win. Jennifer Ross is working to receive a robotics certificate and is one of only two women in the class, but feels confident having previous technology classes under her belt. “If you feel good in what you’re doing and you feel confident, it helps,” she said. Though Ross had one of the fastest robots on the day of the midterm, but was unable to secure the win. She was in second place at one point in the race. Ross ended up in third place with a time of 30.7 seconds, Jason Wilkes took second place with 30.43 seconds and Phil Wiecek won gold with a time of 29.87 seconds. 1 Comment on "ARC welcomes racing robots"
Congratulations to Jordan Meyer and the students of ARC for turning tech into such a fun competition. You’re learning programming the right way – with a project!